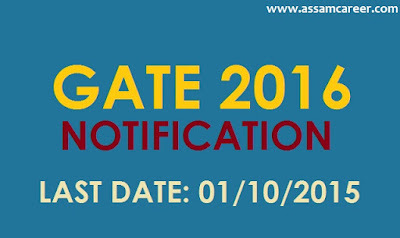 Indian Institute of Science (IISC) Organizing Graduate Aptitude Test in Engineering (GATE 2016) Examination scheduled to be held between 30th January 2016 and 7th February 2016 (Only Saturdays and Sundays). The Online Registration start from 1st September 2015 and the Registration close on 1st October 2015. GATE 2016 Examination for Admission to Postgraduate Courses (Master's and Doctoral) with MHRD and other Government Scholarships / Assistant-ships in Engineering / Technology / Architecture / Science are open to those who qualify in GATE. The GATE Score also valid for some Government Public Sector Units (PSU) Recruitment. Examination Pattern: The Examinations for all the papers will be conducted as Computer Based Tests only. The Date of exam Between 30th January 2016 and 7th February 2016 (On Saturdays and Sundays). The exact schedule will be given on the GATE 2016 website. Validity: The GATE 2016 Score will be valid for 03 Years Only from the date of announcement of Results (from 19th March 2016).